We live in the world of imagined hierarchies.All the civilizations in the world are fraught with contradictions in which unequal power relations are systematically maintained. In hegemonic power structure, some roll in material prosperity while others reel under perpetual pain and poverty. Metaphorically, in the game of life, some of the players play only for bronze medal. In such a system some enjoy perennial privileges while others are marginalized, and are subjected to disabilities and disadvantages. In such a system woman is a property that is used at will and whims of its owner; in such a system, caste – top or bottom does matter; in such a system a big thief roam free and a small thief get caught— or even ifone isnot, he/she is coerced into admitting to be so. Human Rights and Literature unravels the hegemonic power structures inherent in our society. It foregrounds fundamental human rights and examines how violence—direct, structural and epistemic violates human rights of those on the fringe of society. The book explores humiliation, dehumanization, deprivation, marginalization and peripherization of women, dalits, muslims, children and the poor.Examination of violation of human rights is the crux of the book. In addition to academic and empirical research, select literary texts by Arundhati Roy, Vikas Swarup, Kiran Desai and Arvind Adiga have been investigated and analyzed to substantiate the arguments. 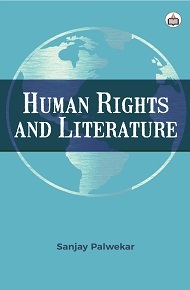 Human Rights and Literature includes six chapters; chapter I“Understanding Human Rights” surveys evolution of basic premises of human rights globally; it also identifies provisions as to protection of fundamental rights enshrined in Indian Constitution. The chapter includes a brief profile of the creative writers under study. Chapter II “Caste Gender and Minority” is about diachronic and synchronic study of space dalits, tribals, women and muslims have in Indian society. Chapter III “Caste, Minority and Human Rights” illustrates discrimination, deprivation and violence againstdalits and muslims in the literary texts; Chapter IV“Gender and Human Rights” examines violation of human rights of women in the select texts; Chapter V “Class and Human Rights” shows how violation of human rights of the poor are violated in the select texts; Chapter VI “Epilogue” is the supplement to the foregoing chapters, and provides fundamental arguments for developing better human society for us all. Besides, the chapter draws on Gramsci, Foucault, Althusser, John Dewey and Galtang to get the arguments to logical conclusion. Sanjay Palwekar is Associate Professor at the Department of English, Rashtrasant Tukdoji Maharaj Nagpur University, Nagpur (India). He is the author of Literature and Environment. He had edited the book Multiculturalism: Dynamics and Challenges with Qingxin Jiang (China) and HaticeSitki (Australia). He has co-edited Mapping Caste and Gender with Professor Shende and Dr. Rashmi Tikku. He has completed University Grants Commission sponsored Majour Research Project on “Environment and Literature: A Study of select Indian, British and American Writers.” He has also completed RTM Nagpur University funded minor research project on “Violation of Human Rights”. He has presented research papers in international conference in the US, UK, Romania and India. Numbers of research papers are to his credit.